Maintaining hydration is important whether we are exercising or not. Many outdoor fitness, fitness boot camp and military fitness providers currently give their members an opportunity to rehydrate by providing water stops during their sessions, typically halfway through. However, there is currently some debate over what the optimum levels of hydration are both in general and during exercise. Drinking water is a low-cost, calorie-free way of increasing the amount of water available to your body and it is also kind to teeth (it lacks sugars, additives and so on). However, water also comes from the food that we eat and other drinks that we consume. Fruit and vegetables are an invaluable source of vitamins, minerals and fibre but are also a good source of water and so should be included in the daily diet. Drinking too much water can lead to a condition known as water intoxication. Water intoxication is most commonly seen in infants under the age of six months and sometimes in athletes. The Human body requires 1-1.5 ml/kg/hour of water therefore the average 70 kg person requires 2-2.5 litres of fluid a day. The kidneys of a healthy adult can process fifteen litres of water a day but the body and kidneys cope best when the water is drunk in small quantities throughout the day. Exercisers are unlikely to suffer from water intoxication, even if they drink a lot of water, as long as it is drunk over time (this is discussed in more detail later). The key is to ensure that an exerciser remains well-hydrated but not over hydrated. Dehydration during exercise may be reduced or prevented by drinking sufficient amounts of fluids during sports activities when the greatest water loss is expected to occur, and also prior to exercising. However, the frequency of drinking and the amount consumed will depend on many factors (Figure 1). Physical characteristics of the individual include actual body weight, lean body weight and individual sweating characteristics. In very hot and humid climates, it is advisable for outdoor sports and activities to be performed in the early morning or late afternoon, and it is best to avoid unnecessary physical exertion during the hottest times of the day. When exercising for short periods or at low intensities, it may not be necessary to drink anything. Water is perfectly adequate in these situations if something is needed. There is much debate at the moment regarding the role of sports drinks in relation to physical activity and exercise (Thring, 2012). Some institutions are advocates such as the European Hydration Institute (EHI, 2012) who suggest that consumers may want sports drinks for reasons of variety, taste and reductions in the sensation of effort. Some institutions are against this, such as the British Medical Association (Cohen, 2012; Heneghan et al., 2012) who suggests that claims made by the drinks industry are unsubstantiated or even misleading for consumers. The type of fluid an individual chooses to consume in order to hydrate is a matter of personal choice, although some researchers would argue that being informed about the facts should also play a role (Noakes, 2012); an argument I wholeheartedly agree with. Other researchers suggest that although “water can promote an adequate hydration status, sports beverages seems to offer a better fluid replacement” (Prado et al., 2009, p.219). Most, if not all, training providers will provide their members with opportunities to hydrate (pre-, during and post-session) but this will come in the form of water. Although this will be due to cost implications rather than an anti sports drink stance. In the author’s experience members have requested a ‘water stop’ after only fifteen minutes of exercise (of which ten minutes was the warm-up) due to being, in their words, thirsty from the exercise. A person’s perceived level of hydration and feelings of thirst are an individual issue, but what is the actual evidence to suggest we need hydrated during a short period of exercise? Before delving into the scientific pool of knowledge regarding the subject of hydration in relation to exercise, one must understand two important concepts. The first one is drinking to thirst where a person drinks enough to optimise their performance. The second is full fluid replacement where a person drinks to completely offset sweating. Within the sports science and coaching communities there is currently much debate regarding these two polar concepts. An important consequence of drinking to thirst is that there is the potential that a substantial body mass loss can occur (Zouhal et al., 2010) and thus reduce performance. However, drinking according to the dictate of thirst throughout a marathon seems to confer no major disadvantage over drinking to replace all fluid losses (Noakes, 2007), and there is no evidence that full fluid replacement is superior to drinking to thirst (Noakes, 2007). However, Williams et al. (2011) suggest that marathon runners need to be more effectively educated about safe fluid intake during marathons as a significant proportion of the runners used drinking strategies that put them at risk of exercise-associated hyponatraemia (EAH, discussed later). A meta-analysis of cycling studies concluded that drinking either more or less than to thirst impairs exercise performance (Goulet, 2011). This analysis also found that up to a 4% body mass loss did not alter outdoor cycling performance, nor do the world’s best marathon runners maintain their body mass within current recommended ranges of 2-3% during successful marathon racing. This evidence and the finding that the athletes who lose the most body mass during marathon or ultra-marathon races and Ironman triathlons are usually the most successful, would suggest that there exists a tolerable range for dehydration that may not negatively impact on running performance. Pitsiladis and Beis (2012) actually argue that this mass loss might even confer an advantage by preventing a substantial increase in body mass because of the ‘overconsumption’ of large volumes of fluid. Here comes the ‘science bit’. Dehydration (or hypohydration) occurs when the body loses more water than is taken in. It is often accompanied by disturbances in the body’s mineral salt or electrolyte balance, especially disturbances in the concentrations of sodium and potassium (Noakes, 2007). All of the processes in the Human body require water concentrations, temperatures and minerals within narrow limits to operate efficiently, or at all in some cases. Under typical circumstances the body loses and needs to replace approximately 2-3 litres of water daily. Breathing, urinating, defecating, and perspiring all cause water losses that need to be replaced on a daily basis. When water is lost from the bloodstream, the body can compensate, somewhat, by reabsorbing more water during the filtering process in the kidneys or shifting water from cells into the blood vessels. This is the process of osmosis, where water flows from an area full of water (high water concentration) to low. These are only short-term solutions (Noakes, 2007). If the lost water is not replenished, the body may suffer serious consequences. However, the body is not great at monitoring the amount of water it needs to function and the thirst mechanism signals the body to drink when the body water content is reduced. Hormones, including anti-diuretic hormone (ADH), work within the kidney to limit the amount of water lost in the urine when the body needs to conserve water. Water intake and output are highly variable but closely matched to less than 0.1% over an extended period through homeostatic control (Noakes, 2007). Electrolyte intake and output are also closely linked, both to each other and to the hydration status. This is also closely monitored and controlled by the kidneys. Isotonic: is characterised by isotonic loss of both water and solutes (most importantly sodium) from the extracellular fluid when both water and sodium are lost in equivalent amounts. This tends to occur with vomiting, diarrhoea or through inadequate intake. There is no osmotic shift of water from the intracellular space to the extracellular space. This type of dehydration accounts for cases of dehydration in young children. Hypertonic: in hypertonic dehydration water loss exceeds salt loss, that is when more water than sodium is lost. This tends to occur with inadequate water intake, excessive sweating, osmotic diuresis and diuretic drugs. This is characterised by an osmotic shift of water from the intracellular fluid to the extracellular fluid. This type of dehydration is more common in people who have diabetes, and it accounts for approximately 10-20% of all paediatric cases of dehydration with diarrhoea. Hypotonic: in hypotonic dehydration more sodium than water is lost. This can occur with sweat or gastro-intestinal water losses or when water and electrolyte deficits are replaced with water only. This leads to an osmotic shift of fluid from the extracellular area to the intracellular. It also occurs with excessive intakes of plain water or other liquids with little or no sodium content (this is called hyponatraemia). This type of dehydration accounts for approximately 10-15% of all paediatric cases of dehydration with diarrhoea. This can be life-threatening as it can lead to swelling on the brain (cerebral oedema). Water is the major constituent of the human body accounting for approximately 70% (Guyton & Hall, 2011). Total body water content is tightly regulated, with the goal being to ensure that the water content of the cells and their size remains within a homeostatically regulated range (Noakes, 2012). Humans evolved as long distance persistence hunters on the arid savannahs of south and east Africa. Noakes (2012) argues that we inherited the capacity to regulate our body temperatures during prolonged exercise in dry heat despite quite large reductions in total body water; no other mammal has the equivalent capacity. Noakes (2012) states that Humans do not regulate fluid balance on a moment to moment basis and because of evolutionary history are delayed drinkers, and therefore correct the fluid deficits generated by exercise at, for example, the next meal, when the electrolyte (principally sodium but also potassium) deficits are also corrected. As a result, Noakes (2012) suggests there is no need to completely replace any fluid deficit as it develops, either at rest or during exercise. People optimise their hydration status by drinking according to the dictates of thirst. Noakes (2012) argues that over the past 40 years consumers have been misled – mainly by the marketing departments of companies selling sports drinks – to believe that they need to drink to stay ‘ahead of thirst’ to be optimally hydrated. In fact, relatively small increases in total body water can be fatal, with a 2% increase in total body water producing generalised oedema that can impair athletic and mental performance. Greater levels of over-hydration can result in hyponatraemic encephalopathy (severe cerebral oedema that produces confusion, seizures, coma, and ultimately death from respiratory arrest) (Noakes, 2012). Sweat is a relatively dilute plasma secretion containing more water than electrolytes. As a result, sweating increases blood sodium concentrations and osmolality. These increases are sensed by receptors in the hypothalamus, the area of the brain which responds by producing hormonal and behavioural changes designed to maintain the osmolality within the homeostatically regulated range (Noakes, 2012). Hormonal changes act by increasing sodium and water re-absorption in the kidney, the hormone involved is called antidiuretic hormone (ADH). Reflex stimulation of the anterior cingulate gyrus, the area of the brain that produces the conscious sensation of thirst that drives water seeking behaviour. As the sensation of thirst rises exercise performance becomes progressively impaired. This is a useful control since it reduces the exercise intensity and hence the possibility of on-going large water loss through further sweating. When sufficient fluid and solute have been ingested to correct the blood osmolality, the sensation of thirst will cease. This control ensures that humans always drink just enough but not too much. There is no intrinsic biological drive that will cause over-drinking (Noakes, 2012). Voluntary over-drinking causes blood osmolality to fall, which should inhibit thirst and reduce the release of ADH, leading to water re-absorption in the kidney tubules and is one of the most potent human hormones. Paradoxically, athletes who develop exercise associated hyponatraemic encephalopathy report persistent thirst and retain fluid, even though their blood osmolality is falling; this suggests the presence of the syndrome of inappropriate ADH secretion (Noakes et al, 2005; Noakes, 2012). Dehydration is not a medical illness, per se (Noakes, 2012) but refers to a reduction in total body water content. The only real symptom of dehydration is thirst, the effect of which is to induce drinking (Goulet, 2011). There is a limited risk that dehydration can occur in healthy athletes competing in a modern endurance event in which ample fluid is available (Noakes, 2012). Only when the total body water is reduced by about 15% – as occurs in those lost in the desert without water for more than 48 hours – is voluntary motor activity completely inhibited, resulting in paralysis (Noakes, 2012). Noakes (2012) suggests that confusion arose when the erroneous belief that all athletes who collapse after exercise are suffering from a dehydration induced heat illness was promoted as part of the ‘false science of hydration.’ This confusion dictated that people collapsing needed to drink more fluids during exercise and immediate resuscitation with large volumes of intravenous fluids. However, athletes who collapse are neither hotter nor more dehydrated than control runners who complete the same races without collapsing (Holtzhausen et al., 1994; Noakes, 2012). Sporadic cases of heatstroke are also not caused by dehydration (Rae et al, 2008; Noakes, 2012). Hydration influences the regulation of body temperature in competitive athletes only indirectly. The key determinant of the body temperature during exercise is the exercise intensity or metabolic rate; the greater the intensity, the higher the temperature (Noakes, 2012). Humans can raise their body temperatures slightly more (adaptive heterothermy) when forced to exercise without any or optimum fluid replacement. The higher body temperature increases the gradient for heat loss by convection, thus reducing the need to increase sweat losses to maintain safe body temperatures and conserving water. A New Zealand study in the British Journal of Sport Medicine (Wall et al., 2013) also casts doubt on the whole idea that dehydration impairs sports performance in the heat. Ten Kiwi competitive cyclists volunteered to undergo deliberate dehydration to -3% by performing two hours of submaximal exercise (walking and cycling) in the heat (33C). They were then reinfused with saline to replace 100%, 33%, or 0% of fluid losses, leaving them 0%, -2%, or -3% hypohydrated, respectively. Participants then completed a 25 km time trial in the heat, during which their starting hydration status was maintained by infusing saline at a rate equal to their sweat rate. No difference in performance was seen between the groups, who were blinded to their treatment. Medical professionals often assume that athletes collapse after exercise because they are hypotensive, and hyperthermic, as a result of dehydration. In fact, it is argued that most have exercise associated postural hypotension. This is where blood pressure drops within seconds or minutes of stopping exercise – leading to less blood flow to the heart and brain – causing fainting in susceptible individuals (Holtzhausen et al., 1994; Holtzhausen & Noakes, 1995; Noakes, 2012). The general consensus regarding treatment is to place the athlete in the head down Trendelenberg position (Anley et al., 2011). McGarvey et al. (2010) argue that clinical signs of dehydration (e.g. sleepiness or tiredness, constipation, dizziness or lightheadedness or decreased urine output) are unreliable in detecting substantial fluid loss in athletes completing endurance events. Athletes who finish exercise with thirst are mildly dehydrated and need to eat and drink in order to replace their solute and fluid deficits (Noakes, 2012). Noakes (2012) argues that athletes who complete exercise without thirst do not need any specific treatment and, therefore, any presenting complaints in athletes who do not report that they are also thirsty cannot be caused by dehydration. By contrast, the symptoms and signs of over-hydration are unmistakable. The increase in water leads to a lowering of the sodium concentration in the blood (hyponatraemia) and the athlete shows marked changes in cerebral function, from mild withdrawal, to confusion, seizures, and coma. The diagnosis is confirmed by measuring blood sodium concentration; the lower the value, the more severe the fluid overload (Irving et al., 1991; Noakes et al., 2005). Over-hydration is treated by absolute fluid restriction and bolus 3-5% hypertonic saline infusions for those with confusion or coma (Hew-Butler et al, 2005). This rapidly reverses the mental confusion in people with mild hyponatraemia (Hew-Butler et al., 2008) and produces rapid diuresis in those with exercise associated hyponatraemic encephalopathy. If brain swelling is so advanced that there is a high risk of respiratory arrest or cerebellar coning, diuretics and intravenous mannitol infusions may be needed (Cuthill et al., 2009). The military has known for a number of years that dehydration before commencing all forms of exercise appears to have been a contributing factor in a number of cases (Carter, 2003). As such all personnel are strongly advised to drink water prior to, during and after arduous exercise. The military even produced data (Table 1) which indicates the amount of water (via water bottles equal to 2 pints) required per hour of continuous work at various Wet Bulb Globe Temperatures (WBGT) for acclimatised personnel (Carter, 2003). The military also advocates that water intake should be spread over the exercise period as fluid is best tolerated in small quantities. Hydration is an important element for exercisers to consider. At one end of the drinking spectrum, dehydration, if sufficiently severe, adversely affects athletic performance and poses a risk to health and on the other, drinking too much can lead to severe problems which may require medical intervention. Non-endurance (i.e. strength and power) events are generally less affected by the level of hydration than endurance events and although mild dehydration is not harmful, many athletes begin exercise already dehydrated (Maughan & Sherriffs, 2010). As such, athletes are encouraged to begin exercise well hydrated and, where opportunities exist, to consume fluid during exercise to limit water and salt deficits. However, for the average member attending a boot camp these extremes are unlikely to be an issue and most training providers already follow this advice. Reputable training providers should provide their members with evidence-based advice on hydration, both verbally and via content on their websites, as a matter of course. A measurement of urine concentration that depends on the number of particles dissolved in it. Values are expressed as milliosmols per kilogram (mOsm/kg) of water. Osmolality is the concentration of solutes, like sodium, in the blood. Hypotensive means low blood pressure. Hyperthermic means a higher than normal body temperature. The person is supine (on their back) on a surface inclined 45 degrees, head at the lower end and legs flexed over the upper end to increase blood flow to the heart and brain. This is where a swollen brain is squeezed out of the base of the skull. A poorly metabolised sugar used as an osmotic diuretic and in kidney function tests. Thring, O. (2012) Do Sports Drinks and Hydration Theory Hold Any Water? Available from World Wide Web: <http://www.guardian.co.uk/lifeandstyle/wordofmouth/2012/aug/07/sports-drinks-hydration-theory-water> [Accessed: 13 December, 2012]. EHI (European Hydration Institute) (2012) How is Dehydration Caused? Available from World Wide Web: <http://www.europeanhydrationinstitute.org/how_is_dehydration_caused.html?gclid=COTHxeynl7QCFe_MtAodagYANQ> [Accessed: 01 December, 2012]. Cohen, D. (2012) The Truth About Sports Drinks. British Medical Journal. 345 (19 July 2012), pp.20-28. Heneghan, C., Howick, J., O,Neill, B., Gill, P.J., Lasserson, D.S., Cohen, D., Davis, R., Ward, A., Smith, A. & Jones, G. (2012). The Evidence Underpinning Sports Performance Products: A Systematic Review. British Medical Journal Open. 2(4), pp.1-6. Noakes, T.D. (2012) Waterlogged: The Serious Problem of Overhydration in Endurance Sports. Leeds: Human Kinetics. Prado, E.S., da Silva Barroso, S., Gois, H.O. & Reinert, T. (2009) Hydration State in Swimmers After Three Different Forms of Hydric Replacement in the City of Aracaju – SE – Brazil. Fitness and Performance Journal. 8(3), pp.218-225. Zouhal, H., Groussard, C., Minter, G., Vincent, S., Cretual, A., Gratas-Delamarche, A. & Noakes, T. (2010) Inverse Relationship between Percentage Body Weight Change and Finishing Time in 643 Forty-two-kilometre Marathon Runners. British Journal of Sports Medicine. 45(14), pp.1101 -1105. Noakes, T.D. (2007) Drinking Guidelines for Exercise: What Evidence is There That Athletes Should Drink “As Much As Tolerable,” “To Replace The Weight Lost During Exercise” or “Ad Libitum”? Journal of Sports Sciences. 25(7), pp.781 -796. 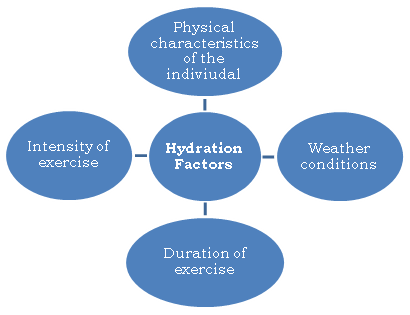 Williams, J., Kipps, C. & Tzorgiou, V. (2011) An Exploration of the Hydration Strategies of The Runners of the 2010 London Marathon by Questionnaire. British Journal of Sports Medicine. 45(2), pp.E1. Peronnet, F. (2010) Healthy Hydration for Physical Activity. Nutrition Today. 45(Suppl. 6), pp.S41-S44. Goulet, E.D. (2011) Effect of Exercise-induced Dehydration on Time-trial Exercise Performance: A Meta-analysis. British Journal of Sports Medicine. 45, pp.1149 -1156. Pitsiladis, Y. & Beis, L. (2012) To Drink Or Not To Drink To Drink Recommendations: The Evidence. British Medical Journal. 345: e4868. Guyton, A.C. & Hall, J.E. (2011) Guyton and Hall Textbook of Medical Physiology. 12th ed. Philadelphia, PA: Saunders-Elseiver Health Sciences. Noakes, T.D., Sharwood, K., Speedy, D., Hew, T., Reid, S., Dugas, J., Almond, C., Wharam, P. & Weschler, L. (2005) Three Independent Biological Mechanisms Cause Exercise-associated Hyponatremia: Evidence from 2135 Weighed Competitive Athletic Performances. Proceedings of the National Academy of Sciences of the United States of America. 102, pp. 18550 -18555. Holtzhausen, L.M., Noakes, T.D., Kroning, B., de Klerk, M., Roberts, M. & Emsley, R. (1994) Clinical and Biochemical Characteristics of Collapsed Ultra-marathon Runners. Medicine and Science in Sports and Exercise. 26, pp.1095-1101. Rae, D.E., Knobel, G.J., Mann, T., Swart, J., Tucker, R. & Noakes, T.D. (2008) Heatstroke during Endurance Exercise: Is There Evidence for Excessive Endothermy? Medicine and Science in Sports and Exercise. 40, pp.1193-1204. Holtzhausen, L.M. & Noakes, T.D. (1995) The Prevalence and Significance of Post-exercise (Postural) Hypotension in Ultramarathon Runners. Medicine and Science in Sports and Exercise. 27, pp.1595-1601. Anley, C., Noakes, T., Collins, M. & Schwellnus, M.P. (2011) A Comparison of Two Treatment Protocols in the Management of Exercise-associated Postural Hypotension: A Randomised Clinical Trial. British Journal of Sports Medicine. 45, pp.1113-1118. McGarvey, J., Thompson, J., Hanna, C., Noakes, T.D., Stewart, J. & Speedy, D. (2010) Sensitivity and Specificity of Clinical Signs for Assessment of Dehydration in Endurance Athletes. British Journal of Sports Medicine. 44, pp.716-719. Irving, R.A., Noakes, T.D., Buck, R., van Zyl Smit, R., Raine, E., Godlonton, J. & Norman, R.J. (1991) Evaluation of Renal Function and Fluid Homeostasis during Recovery from Exercise-induced Hyponatremia. Journal of Applied Physiology. 70, pp.342-348. Hew-Butler, T., Almond, C., Ayus, J.C., Dugas, J., Meeuwisse, W., Noakes, T., Reid, S., Siegel, A., Speedy, D., Stuempfle, K., Verbalis, J., Weschler, L. & the Exercise-Associated Hyponatremia (EAH) Consensus Panel. (2005) Consensus Statement of the 1st International Exercise-associated Hyponatremia Consensus Development Conference, Cape Town, South Africa. Clinical Journal of Sport Medicine. 15, pp.208-213. Hew-Butler, T., Noakes, T.D. & Siegel, A.J. (2008) Practical Management of Exercise-associated Hyponatremic Encephalopathy: The Sodium Paradox of Non-osmotic Vasopressin Secretion. Clinical Journal of Sport Medicine. 18, pp.350-354. Cuthill, J.A., Ellis, C. & Inglis, A. (2009) Hazards of Ultra-marathon Running in the Scottish Highlands: Exercise-associated Hyponatraemia. Emergency Medicine Journal. 26, pp.906-907. Carter, K.M. (2003) Heat Illness – Prevention/Detection and Treatment. Aldershot: Army School of Physical Training. Maughan, R.J. & Sherriffs, S.M. (2010) Development of Hydration Strategies to Optimize Performance for Athletes in High-intensity Sports and in Sports with Repeated Intense Efforts. Scandinavian Journal of Medicine and Science in Sports. 20(suppl. 2), pp.59-69.